Mary & Geoff Turvil welcome you to the site for Powder Compacts, Lea Stein, Pavone, Butler & Wilson, Christmas Tree brooches and pins, Perfume bottles and Fashion accessories, good quality costume jewellery, knife rests and small quality antiques. Butler & Wilson update coming soon!! Next Fair:- Vintage & Retro Fair, Rogate Village Hall, North St, Rogate, GU31 5BH (near Petersfield) – 14th April 2019. 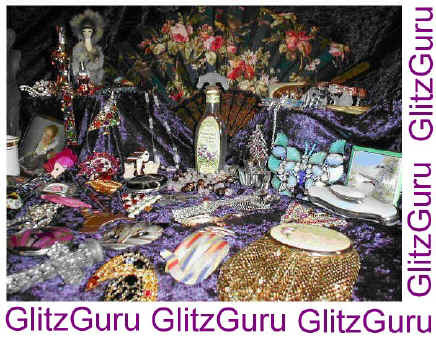 We have been selling powder compacts, costume jewellery and small antiques for over 10 years. We specialize in Powder compacts, Lea Stein, Christmas Tree brooches and vanity items but always have something interesting for you to view. We want you to enjoy your shopping experience with us so feel free to email us with any questions or requests and we will endeavor to get back to you as quickly as possible. We will be changing our stock on a regular basis so if you don’t find anything that grabs you on this visit pop back again or better still add us to your favorites list. If you want to come and meet us we will be selling at several major antiques fairs this year (click here for details).